The American Institute of Architects Los Angeles (AIA|LA) chapter recently announced the winners of its 2017 Design Awards, which recognizes practices and projects across the region in categories celebrating overall design, status as rising talent, and quality of environmental sustainability. The three award categories—Design Award; Next L.A.; and COTE—paint a picture of the diverse and multi-faceted character of Los Angeles’s architecture scene, with winners representing a broad spectrum of practice. 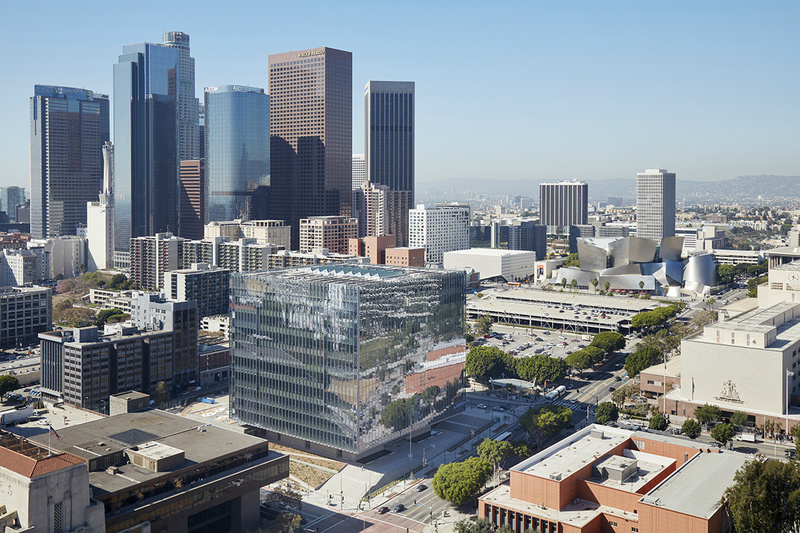 AIA|LA’s Design Awards highlighted two projects in particular with top honors: The New United States Courthouse by SOM and the Crest Apartments by Michael Maltzan Architecture (MMA). Since opening in late 2016, the new courthouse has become one of the region’s premier public buildings. The iconic cube-shaped structure utilizes a 28-foot cantilever over the ground floor areas to create an open, public plaza and garden designed by Mia Lehrer + Associates. MMA’s Crest Apartments, on the other hand, is a very different sort of project. 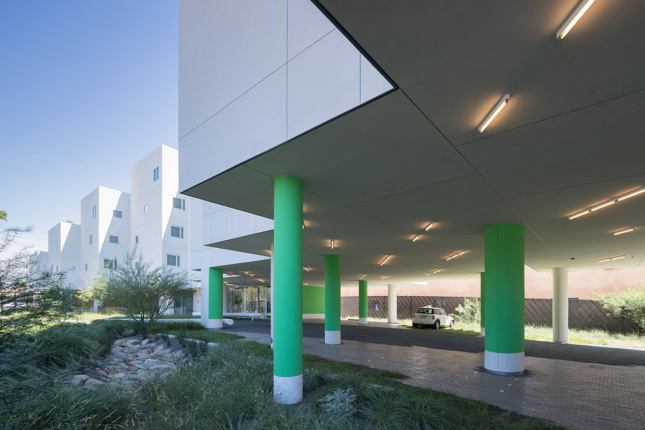 The 64-unit affordable housing project utilizes minimal ground floor structure and exuberant plantings and paving strategies to create flexible recreation spaces that double as car parking when not in use. The project was developed with Skid Row Housing Trust to benefit veterans who have previously experienced homelessness. 2017 AIA|LA Design Awards jurors were Gabriela Carrillo, co-founder, Taller | Mauricio Rocha + Gabriela Carrillo; Lance Evans, associate principal and senior vice president, HKS Architects; and Neil M. Denari, professor, Department of Architecture and Urban Design at UCLA. TWA’s concept for a new billboard locates the object on the ground and utilizes the structure to anchor a public plaza. The AIA|LA Next L.A. awards honor yet-to-be-built projects that are in the design and planning stage. 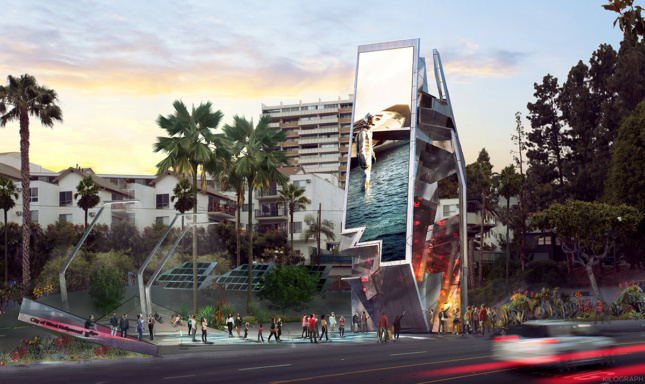 This year’s winning project—The West Hollywood Belltower—is designed by Tom Wiscombe Architecture. The project aims to redefine the vernacular billboard as a spatial, digital installation framed by a public park. The proposal was generated as part of a design competition orchestrated by the City of West Hollywood to guide the design of future billboards. Jurors for AIA|LA Next L.A. awards were: Mark Foster Gage, principal, Mark Foster Gage Architects; Alvin Huang, design principal, Synthesis Design + Architecture; and Julia Koerner, Director, JK Design GmbH. AIA|LA’s Committee on the Environment focuses on highlighting projects that “demonstrate achievement in the implementation of sustainability features” and is awarded by a panel of experts who focus on performance, systems integration, and sustainability research. 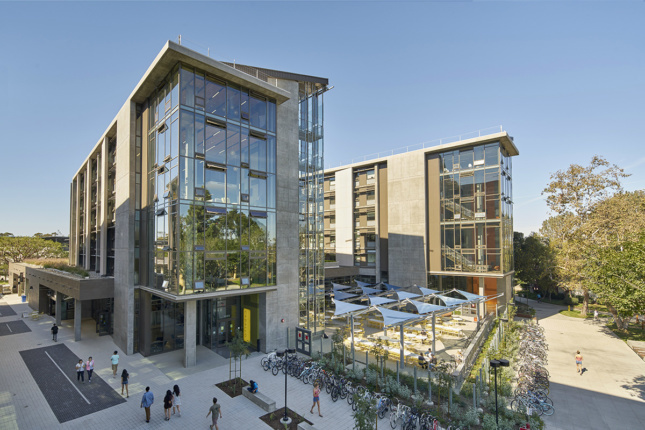 For 2017, the committee awarded four projects with top honors, including the Mesa Court Towers at University of California, Irvine designed by Mithun. The project features a LEED Platinum sustainability rating, exterior circulation, and an emphasis on day-lit spaces. Other winners in the category include: the J. Craig Venter Institute La Jolla by ZGF Architects; the New United States Courthouse by SOM; and The SIX Veterans Housing by Brooks+Scarpa. The jurors for the 2017 AIA|LA COTE Awards were: Ezequiel Farca, creative director, Ezequiel Farca + Cristina Grappin; Dan Heinfeld, president, LPA; and Ben Loescher, founding principal, Loescher Meachem Architects.